Two Indian Air Force (IAF) aircraft shot down this morning of Wednesday by the Pakistan Air Force (PAF) in air combat, two Indian pilots captured. It was announced by the spokesperson of Pakistan Inter-services Public Relation. Military spokesperson said that one Indian pilot is admitted in one military hospital. He said that the Indian aircraft crossed the Line of Control on Kashmir side. Pakistani fighter jets targeted Indian forces supply depots across the Line of Control (LoC) from within friendly airspace as the country’s armed forces struck back after unprovoked Indian aggression a day earlier. 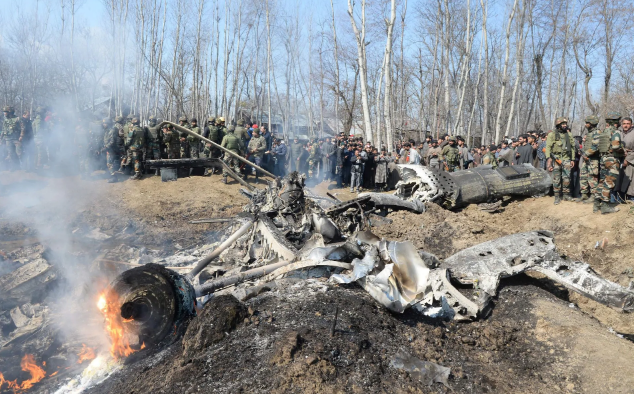 The wreckage of one of the IAF jets fell within Azad Jammu and Kashmir (AJK) while the second fell in Indian occupied Kashmir. About Pakistani strike on Indian Supply depots in disputed Indian Occupied Kashmir, Pakistani military spokesperson said the sole purpose of the airstrikes on Indian military targets in occupied Kashmir was to demonstrate the country’s right, will and capability of self-defence. “We do not wish to go to that route and wish that India gives peace a chance and to resolve issues like a mature democratic nation,” Maj. Gen. Ghaffoor asserted. Both Pakistan and India has shut civil airports near to the borders areas for normal civil flights which include Lahore, Multan, Islamabad and Peshawar in Pakistani side. India has closed airports at Chandigarh, Amritsar, Leh, Srinagar and Jammu, as per media reports. Pakistan denies any F-16 shot down by Indian Air Force, the spokesperson said no F-16 has participated in recent operation.